Msgr. 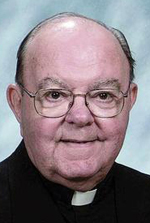 Francis J. Menna, 84, a former pastor, regional vicar and rector of Villa St. Joseph, died Dec. 10. Born in Philadelphia, the son of the late Anthony Menna and the late Antoinette (Melchiorre) Menna, he attended St. Thomas Aquinas School, La Salle College High School and La Salle College. After college he was drafted into the Army infantry and served in Korea during the Korean War before entering St. Charles Seminary, said his sister, Immaculate Heart of Mary Sister Mary Angela. Also during his seminary years, under a program then operated by St. Charles, he catechized by way of mail a young woman in Japan who converted from Buddhism. He also sent her a copy of “Story of a Soul: The Autobiography of St. Therese of Lisieux.” As a result at her baptism the woman took the name of Therese, Sister Mary Angela explained. “He was a peaceful, humble soul; it was never about himself, the priesthood was important to him,” she said. Msgr. Menna was ordained May 16, 1964 by Archbishop John J. Krol at the Cathedral of SS. Peter and Paul. He served as parochial vicar at Holy Savior, Norristown; St. Dorothy, Drexel Hill; St. Mary, Schwenksville and Our Lady of the Holy Rosary, Philadelphia. He was also assistant controller for the archdiocese and a faculty member of St. Pius X High School, Pottstown. He was appointed pastor of St. Francis of Assisi Parish, Philadelphia, in 1978 and parochial administrator and then pastor of St. Patrick Parish, Malvern, in 1985. He was named regional vicar for Delaware County in 1989 and in 1997 he was appointed rector of Villa St. Joseph, the home for retired archdiocesan priests in Darby, and administrator for the Department for Retired Priests. He retired in 2005. Msgr. Michael McCulken, who is scheduled to preach at Msgr. Menna’s funeral Mass, is in a way returning the favor — Msgr. Menna preached at his first Mass after his ordination in 1976. Later when Msgr. Menna was at the Villa as rector, he treated the elderly priests with such kindness, “he was a great example of Jesus,” Msgr. McCulken said. Msgr. Menna’s funeral Mass will be celebrated by Archbishop Charles J. Chaput at St. Francis Country House on Wednesday, Dec. 17 at 11 a.m. Concelebrants will include Msgrs. William Dombrow and Daniel Sullivan; Father Paul Kennedy and Msgr. McCulken. Msgr. Menna is also survived by his sister, Mildred Shammo, and many nieces and nephews. Interment will be at Holy Sepulchre Cemetery, Philadelphia.